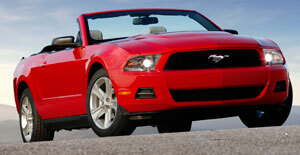 Mustang convertible sales benefited from the government-backed Cash for Clunkers program that ran in July and August. It’s raining on the U.S. economy, with predictable results on convertible sales – deliveries are trending down for the third straight year. But the Ford Mustang, barring a sudden surge in Chrysler Sebring deliveries, will top the segment for the fifth consecutive year. Through September, Mustang convertible deliveries stood at 11,934, albeit down 33.0% compared with year-ago, according to Ford. The Chrysler Sebring convertible placed a distant second, with 6,668 sales, tumbling 71.6%, Ward’s data shows. While there are a number of other convertibles on the market, the Mustang and Sebring largely have been running neck-and-neck for the top spot since 2000. There have been exceptions. In the ’03 model year, the 13,355 Sebring rag-top’ deliveries plunged the model to No.8 in the segment, edged out by the Mustang, Ford Thunderbird, Chevrolet Corvette, Mitsubishi Eclipse, Volkswagen Beetle and BMW Z4 and 3-Series. The Sebring stormed back in ’04 with a vengeance, racking up 64,470 sales and overtaking the Mustang’s 40,252. However, the Mustang this year clearly is in the driver’s seat and not about to relinquish its sales lead anytime soon, says Doug Scott, senior vice president, GfK Automotive LLC, a provider of product, brand and consumer research and consulting to the global automotive industry. The firm’s data measuring the intention of future convertible buyers confirms the Sebring has lost significant ground to the Mustang. Two years ago, the Chrysler drop-top was the preference of 10% of those intending to purchase a convertible compared with 5.7% today. One reason is that Mustang convertible sales benefited from the government-backed “Cash for Clunkers” program that ran in July and August. While most clunker sales “went a lot to the (Toyota) Corolla and (Ford) Escape, “we saw a little bit of uptick in demand for convertibles, largely gobbled up by Mustang,” Scott says. Despite this, the convertible market continues to suffer from the economic recession. Most industry experts peg 2011 as the year when rag-top demand will begin to approach traditional levels. The segment’s best performance dating back to the ’00 model year was in ’04, when 387,532 convertibles were sold, representing 11% of total industry sales, according to Ward’s data. The total seesawed to 314,091 in ’05, 333,991 in ’06 and 327,110 in ’07 before plunging to 264,046 in ’08. Because convertibles often are purchased as second or third vehicles, sales rise and fall with the overall economy, with the segment typically accounting for less than 10% of overall annual industry sales. Although 2009 has yet to close, suppliers to the convertible segment say this year and last have been especially harsh. “We saw in second-quarter 2008 dramatic moves from our conservative (convertible sales) estimation,” says Erik Roeren, president and CEO of Karmann USA Inc.
Andreas Weller, vice president-business development, Webasto Roof Systems Inc., says poor economic conditions have caused many auto makers to concentrate their limited resources in other areas, diverting funds from convertible programs. But there are brighter days ahead, Weller contends. As the economy begins to improve, new players will emerge in the convertible market in an effort to bring some excitement to their brands. Many players have left the segment, including the VW Cabrio, Chevrolet Cavalier and Camaro, Pontiac Firebird and Sunfire, Dodge Prowler and Toyota MR2. Others have entered, including the VW Eos, Mini Cooper and Lexus SC 430. GM has had several popular convertibles in its lineup but will be left with just one – the Corvette – following its post-bankruptcy decision to kill the Saturn and Pontiac brands, spelling the end of the Saturn Sky, Pontiac Solstice and G6. The auto maker also has pulled the plug on the Cadillac XLR roadster, which saw its best year in ’05 with 4,190 deliveries, tumbling to a mere 1,542 in ’08. However, GM will launch a Camaro convertible in 2011. It also reportedly plans to introduce a new Cadillac convertible, says Roeren. The arrival of the Camaro could give Mustang a race for its money among domestic competitors, although it’s unlikely Chevy’s offering will overtake its Blue Oval rival. The VW Eos convertible debuted in ’07 with 11,973 deliveries, although that still trailed such stalwarts as the Mazda Miata, which sold 15,755 units the same model-year. However, the Miata relinquished its lead in the import-convertible segment to the Eos in ’08, with sales of 12,350, compared with the VW’s 14,269. While the convertible market is expected to recover, some experts say the segment likely will swing toward traditional cloth tops, rather than retractable hardtops.